It’s been 6 weeks since I hopped on a plane to travel in flow which has now lead me to a small co-working space in Gracia, Barcelona where I’m writing from. I’ll be honest, I didn’t have a plan… still don’t. And hat has been the beauty of these last 6 weeks, experiencing each day fully present moment to moment being guided not by trip advisor or top 10 things to see lists or even the “must do’s” but instead by my inner GPS. Don’t get me wrong, I love Google Maps and it’s been a lifesaver to physically take me from point A to point B but it’s not the best at telling you WHAT point A and B are… that comes from within. After leaving corporate, and moving out of SF I thought, I would finally have the time to do what I really wanted to do… except I didn’t want to DO anything. I didn’t want to plan out the next day let alone the next 6 months. In the last 6 weeks traveling, I’ve experienced a balance between pressing on and pressing pause. There is a time and place for both. When we feel into what’s next and are motivated to press on (as I am right now in writing this) then go with the flow… but when it’s not there and you don’t feel like doing something… don’t push on … instead press pause. In that pause magic is happening… it can also be said that the “solutions” are happening and when you’re ready to press on again, it will flow. The list goes on and on but these are just a few of the highs that have emerged from the unknown in just a short 6 weeks. Of course with highs come lows and there have been many of those as well sprinkled throughout. Traveling solo followed by deep inner work through yoga brings up a lot of discomfort. It’s easy to run towards your security blanket… in my case to get on a plane and head home. Being with the tension of discomfort is hard, the pressure in needed though to catalyze transformation seen as new possibilities. I’ll end with this disclaimer: Discomfort doesn’t require leaving the country, it appears multiple times in a day. Our natural reaction is to get rid of it as soon as possible either through distraction or disappointment. Transformation happens from the inside out, become aware of the discomfort without trying to change it …. be with it longer than you think you and see what naturally shifts. Enjoy the flow and make shift happen. As always don’t take my word for it, go out there and experiment in the laboratory of your body and report back. 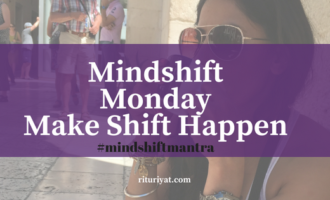 What shifted for you? Post in comments….